The Colossus of Rhodes was located in the wearing of Rhodes in Greece and stood tall as one of the greatest landmarks of the ancient world. It was one of the seven wonders, after all. The statue had been partially destroyed in 225 BC by an earthquake. Then, in 653 AC, the rest of the statue was scraped by an Arab expedition to be sold to a Jewish merchant of Ephesea. A keen group of scientists from Greece, Spain, Italy and UK want to see the wonder stand again in Rhodes. They don’t want to copy the initial design (whose details are sketchy to say the least). Instead, they want Colossus Mk. II to be taller, built with modern techniques and energy self-sufficient. 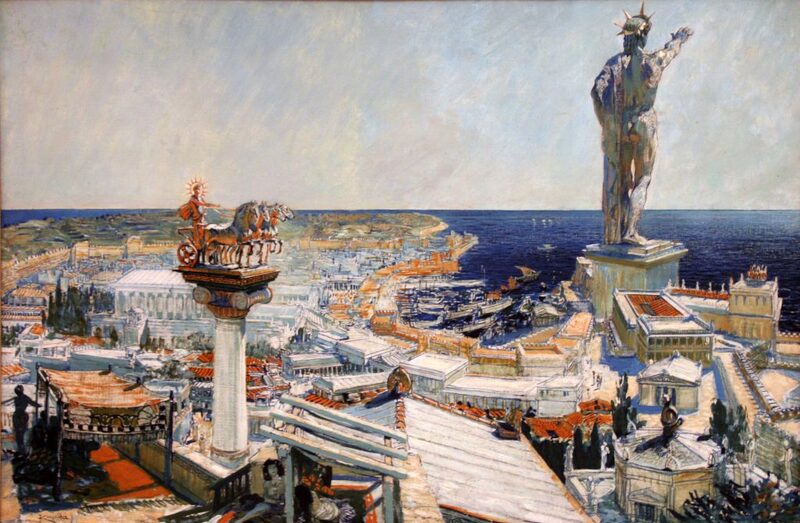 An oil painting representing the ancient city of Rhodes by Frantisek Kupka (1906 CE). 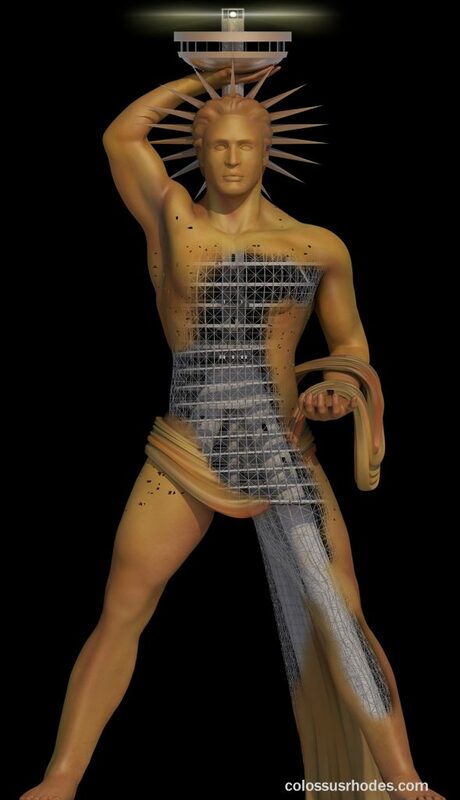 Probably a realistic representation of the Colossus of Rhodes which was a gigantic bronze statue, 32 metres high, of the island’s patron god Helios, the Sun god. The statue was sculpted by Chares of Lindos, c. 304 BCE and was toppled by the earthquake of 228 or 226 BCE. Ancient accounts hold that the Colossus of Rhodes was created in honor of the sun god Helios and to commemorate the Rhodians’ successful defense of their island against a siege led by Macedonian leader Demetrius Poliorcetes in 305 B.C. Made of bronze and based on marble block, the statue was 32 meters (105 feet) high or 14 meters (46 feet) shorter than the Statue of Liberty in New York. It took 12 long years for the Colossus to be raised. Like the Statue of Liberty, the Colossus was located on a podium, with its legs closed. The project, however, designed the new Helios offering with its legs spread out, like we’ve seen in some renditions (paintings, movies or video games), with ships sailing between. 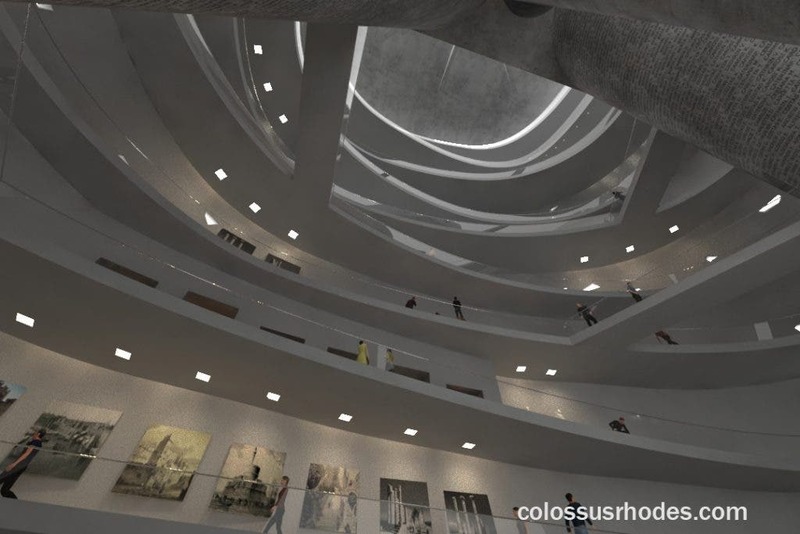 Colossus II, if ever completed, would be 112 meters tall – four times taller than the ancient version. 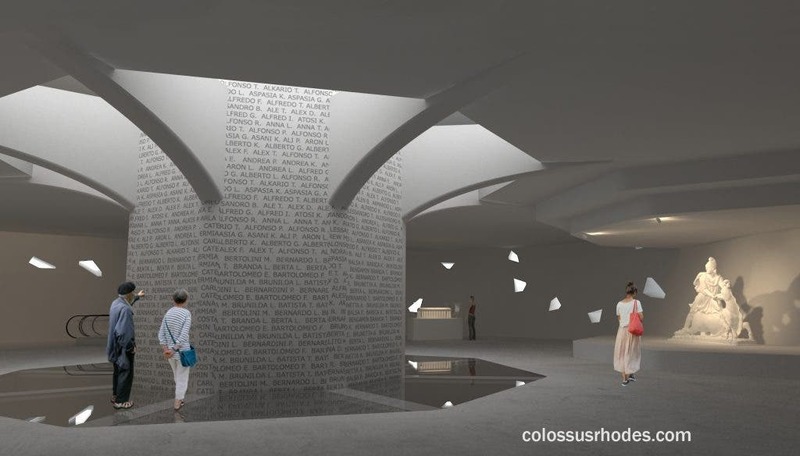 Inside the structure, visitors will be able to attend museums, libraries, conference halls and entertainment centers, while the top level will house a lighthouse visible for tens of miles away. “The construction will exploit the most recent technologies, employing energy from renewable sources and “intelligent systems” to prevent the consequences of earthquakes and wind forces, providing reliability and flexibility. The structure will be completely sustainable, with a hughe contribution in preventing pollution,” the authors of the project write on their website. 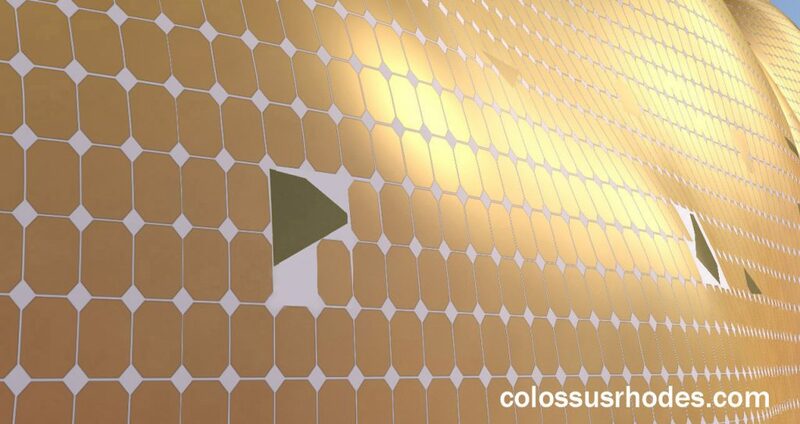 Colossus II won’t be built from bronze, but it will likely be a lot shinier. All the exterior of the structure would be covered with solar cells; enough to supply all the energy needs of the project. Considering the political and economic context of Greece, however, such ideas might sound outrageous. The authors of the projects argue that the $280 million investment could attract many tourists and other investments in the vicinity of the Rhodes island.